This article shows how to install and use content in DAZ Studio 4. It focuses on the basic steps necessary to install and load content for new users in DAZ Studio. This article is designed for new users and users who may want to refresh their understanding of basic content configuration in DAZ Studio. This article does not cover all the details of customization, such as the Content Manager feature (VIEW CATEGORIES). Customization and Content Manager are *not* recommended for new users until they have become familiar with the correct, basic way of installing and using content in DAZ Studio 3. The method for DAZ Studio 3.x is nearly identical, but this article is for DAZ Studio 4 users. It's recommended that you read through this article first before beginning to follow its instructions. Towards the end of this article is a note about the Smart Content Tab in DAZ Studio. In earlier versions of DAZ Studio, this tab was called 'MyStuff.' To jump to the section about the Smart Content Tab now, click here (opens a new window). Two of these steps usually only need to be set up right the first time and then they can be done over and over again with little or no effort. All three of these steps are important, including the readme which is unfortunately often skipped. 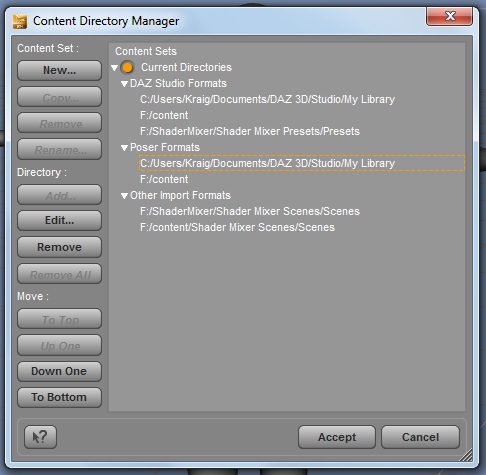 In DAZ Studio 4, the content target folder is 'My Library.' This is analogous to the 'Content' folder in DAZ Studio 3. Additionally, this article tells how to bring your existing content into DAZ Studio 4. This is useful for new users who already have a DAZ Studio 3 content setup and want to use the content in DAZ Studio 4 without re-installing content. DAZ 3D content is provided as one or more installers. These installers are basically self-extracting files with a license agreement and the ability to choose the target folder for installation. They contain all the files necessary to a specific product. File hierarchy can seem confusing, especially to new users. Installers make it easy to choose the same, correct target folder again and again without having to worry about whether the files are written to the correct sub-directories. Bit Rock installers will default to the same path over and over until you change it. So, choose the correct path the first time you install content and you shouldn't have to search or worry about it for future installers. NOTE: Installers must be run as applications. Placing the installer file itself into the content or runtime folder does not install the content. TIP:Many content products consist of several installers. As a rule of thumb, run all of the installers provided, regardless of whether they are designated for DS (_ds_) or for Poser (_dpc_). There are some exceptions, but more often than not, you'll need both the files from the DS installers and the DPC installers. Installers for Carrara (_ca_) are obviously not needed in DAZ Studio. The screen shot below shows the destination directory step in content installation. The path shown below is correct for the system on which the content is being installed. Your path as shown above may be different. You can use the 'browse' button to browse to the correct path. The next time you use the Bit Rock installer it will probably default to that path, so you won't have to browse to that same path each time. TIP: Write down your install path or keep it in a text document until you are familiar with it. Most installers will default with it, but older installers and DS vs DPC content installers may keep the configuration information separate, until you establish the correct path for all of them. So, it's a good idea to keep the path easily available for your reference in the near future. TIP: Use the same install path consistently. Avoid using lots of different paths. This can be very confusing, even for experienced users. TIP: Make sure to see the readme at the end of the installation. The readme tells you the name of the folder to look for in the content library. If you don't look this up in the readme, you'll have to guess where the content is. When done correctly, you only need to configure preferences once. You won't have to configure it or 'search' every time you install content. In fact, it is recommended that you not use the search function in FOLDER VIEW. More information will be given about this later on in this article. Configuration tells DAZ Studio where to look for the content. You can potentially configure Studio to look at a dozen different places. However, for new users, we recommend keeping the configuration as simple as possible. The key idea is that the install path and the configuration paths should match up exactly. So, if your content install path is C:\users\[your user account]\My Documents\DAZ 3D\DAZStudio3\content, then your configuration path in preferences –> Directories in Studio will also be exactly the same, that is, C:\users\[your user account]\My Documents\DAZ 3D\DAZStudio3\content. It's that simple. Here's how to configure the paths for content in the Content Directory Manager. On the PC, in DAZ Studio, go to EDIT –> Preferences –> Content Library –> Content Directory Manager. 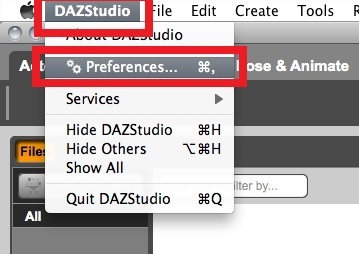 On the Mac, Go to DAZStudio –> Preferences –> Content Library –> Content Directory Manager. You can also open Content Directory Manager on both the Mac and the PC by going to the Content Library Tab (VIEW –> Tabs –> Content Library). Click on the 'Active Tab Options' button in the upper left to open the menu. In the menu, click Content Directory Manger. There are three kinds of content that DAZ Studio can be configured to display in the content tab: DAZ Studio Format (Native), Poser Format (Import), and Other. The drop-down allows you to toggle between the three types. All three can be active in the content tab at the same time. Merely changing from one to the other in the Directories window is for your convenience when configuring and doesn't cause one to have priority over the other. Make sure your install path is indicated for both DAZ Studio and POSER Formats. That's the most important thing. By default DAZ Studio will have some paths for the shader options. You should leave these if you do not want to use this feature at this time. You can always add the paths later. NOTE: Adding or removing a path in directories does not actually add or remove it from your hard drive. TIP: Each path you have in directories creates a new top-level folder in the content tab. If you have invalid paths, then you'll have invalid folders in the content tab. This clutter will make finding content much more difficult and frustrating. Remove invalid paths. Keep it simple. TIP: Any path that ends in 'Runtime' is inherently invalid. Remove all paths that end in 'Runtime' as they will not work correctly. The correct target folder should always be one folder earlier than the 'runtime' folder. When you're done configuring the directories, click on 'Accept' below. DAZ Studio will keep your settings and change the folders in the Content Tab in accordance with those changes. The Content Tab is essential for loading and using content in DAZ Studio. If you're familiar with Poser, the Content Tab is analogous to the Library Panel. By default, the content tab will be on the right side of DAZ Studio if you are using the default interface. If you don't see it, you can open it by going to WINDOW –> Tabs –> Content Library. TIP: If you have the content tab set to FOLDER VIEW, Don't use the search for content feature. This function in practice adds many invalid paths and will cause much more trouble than help. This article explains how to configure your content correctly and makes the search for content feature unnecessary. This tip does not apply to the search function for the content tab when it is in CATEGORY VIEW which requires the search function. New Users and some experienced users often forget this step. The readme is a very simple document that tells you where to find the content when your Tab is in FOLDER VIEW. Some readme's will have additional information on product use. If you don't use the readme, you will have to hunt and peck for the content in the content tab. Users with a large content library will have a lot of work to do indeed without using the readme. Here's a screen shot of the readme for Victoria 4.2 base. Notice the text underlined in red. These tell you where to find the components of the product. Instead of hunting and pecking through the folders, you can see that the first place to look is in the Poser half of the content tab in FIGURES –> DAZ People where you'll find the Victoria 4.2 base. That's a lot easier than looking in the People folder or searching through every folder in FIGURES. I see installers for the product labeled _ds_ and _dpc_. Which ones do I use? You should run both the installers labeled _ds_ and the installers labeled _dpc_ when you are working in DAZ Studio. If you only run the the installers labeled _ds_, you will not get the whole product. What is the difference between the Content Library and Smart Content (formerly My Stuff)? The Content Library is based on the same system used in DAZ Studio 3 and in many ways the Content Library Tab is the same as the Content Tab in DAZ Studio 3. The Smart Content (My Stuff) Tab is the new content system now supported in DAZ Studio 4. The Smart Content (My Stuff) Tab enables an intuitive, easy access of content add-ons. However, in order for the My Stuff tab to work for a content item, it's necessary to create metadata which shows the relationships. This metadata feature is new and most products do not have metadata. Creating this meta data is an ongoing project. For this reason, most products cannot at this time be found in the My Stuff tab. I see different kinds of content, installers, and add-ons for DAZ Studio. Don't I need to use a different install path for each one? The beauty of the install path is that it is the same for all types of content to be used in DAZ Studio. In fact, if you choose to have multiple install paths, you will make the organization and use of your content much more complicated than it needs to be. I can't find the product in the Smart Content Tab. Where is it? Most content sold in the DAZ 3D website was made before the creation and release of DAZ Studio 4. For this reason, most content will be found in the 'Content Library' Tab. Only content that has been made with meta-data will appear in the Smart Content Tab. How do I uninstall Content Products? When you install content, you can choose to let the installer additionally create an uninstaller. This uninstaller can be used to remove the files for the specific content product. This is a lot easier than removing the files manually. If you do not choose to have the installer create an uninstaller, it will not be created. Often new users will struggle looking for newly installed content in the Smart Content Tab (formerly called 'MyStuff'), but not find it, even though they've followed all the steps correctly. The Smart Content Tab is a new feature in DAZ Studio 4. Content must be specially made to show up in the Smart Content Tab. With the aid of metadata, content will show up in the Smart Content Tab. Only products that have metadata installers will show up in Smart Content. 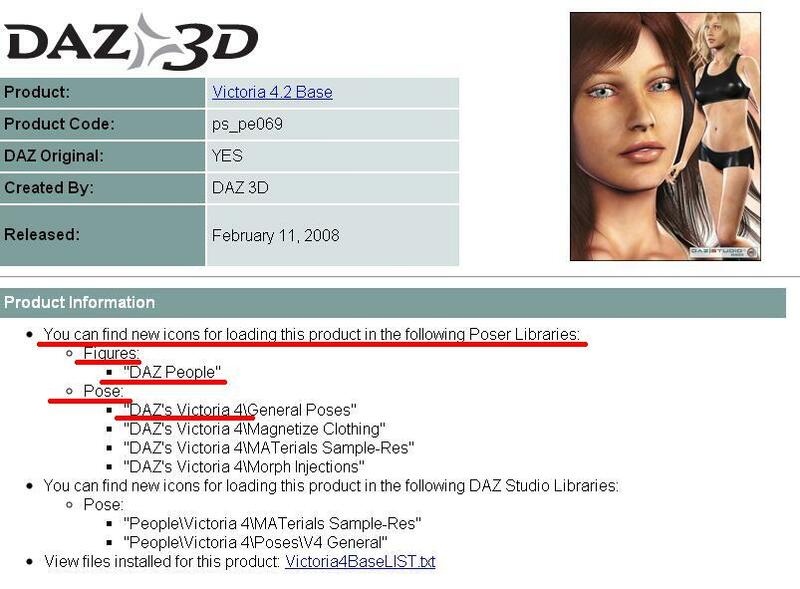 Since most products, including Victoria 4.2 base, Michael 4 base, and their add-ons, were made before DAZ Studio 4, they have no metadata and will not show up in the Smart Content Tab. To find these content products, look in the Content Library as directed in the readme for the particular product. Keep in mind that not all new content will show up in the Smart Content Tab, only content that has metadata installers. Morphs for the Genesis figure will show up in the 'Shaping' Tab or in the 'Posing' Tab, depending on the kind of morph. You can find these and other tabs by going to WINDOW –> Tabs –> [Particular Tab]. This article explains in more detail for curious users and includes information for the hybrid nature of content in DAZ Studio.